"The Little Old Log Cabin in the Lane"
“We were really blown away by it,” Atlanta Planning Commissioner Tim Keane said of the building’s connection to music history. His office is pushing a proposal to give it landmark status. The briefest of encounters ties the two-story office building to a musical legacy, according to a biography of music producer Ralph Peer by author Barry Mazor. 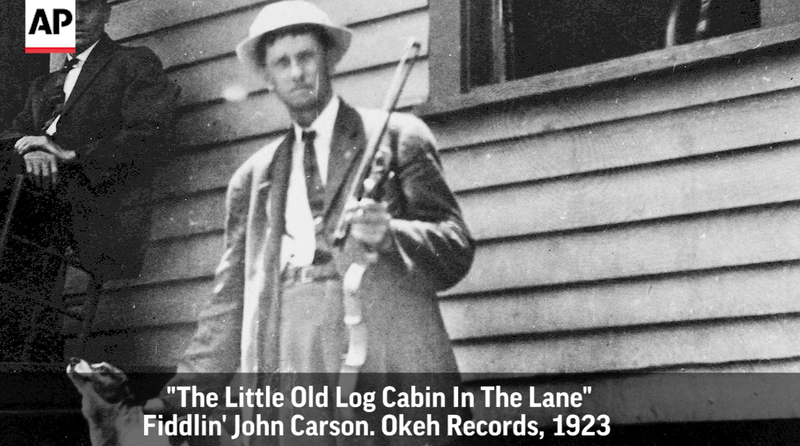 In mid-June 1923, Carson, who came from the mountains but lived in Atlanta, played an old minstrel tune called “The Little Old Log Cabin in the Lane” for Peer of Okeh Records, then a major recording label. To everyone’s surprise, it was a hit. Even Peer is said to have called the recording “plu-perfect awful,” though Mazor says Peer was describing the audio quality, not Carson’s music. The first pressing was limited to no more than 1,000 copies by a skeptical Peer. But Wayne W. Daniel, who wrote about Atlanta’s country music scene in the book “Pickin’ on Peachtree,” reported that Peer said sales eventually topped 500,000. Then last August came an announcement that Orlando, Florida-based Jimmy Buffett’s Margaritaville — which runs an international network of resorts, vacation clubs and restaurants inspired by Buffett’s tequila-flavored beach ballad — planned to develop a restaurant in Atlanta. It would swallow the building at 152 Nassau Street and another behind it, where vintage movie reels once were stored. Downtown Atlanta resident Kyle Kessler, an architect and civic improvement organizer, says he had been researching the neighborhood’s historic significance when the development plans were announced. He set out to determine if the building where Carson recorded could still be standing. Sure enough, Kessler said, a 1923 newspaper article confirmed 152 Nassau Street is the place. Peer had set up what might today be called a popup recording studio there. Mazor said in an interview that it was the first time a major record label brought professional-grade recording equipment into the “field” to seek out local talent on the margins of popular culture among racial minorities and poor country people. Previously, he said such recordings would have been done with studio musicians in New York City or Chicago, and nobody would have recorded a “hillbilly” fiddler. Carson had been a perennial winner of Atlanta’s annual fiddlin’ contests and was the first of what were called “old-time” musicians to play for broadcast on WSB radio — exposure that made him a local fan favorite. Carson also had a less benevolent side. He was known to sing unabashedly racist material and his song “Little Mary Phagan” helped whip up anti-Semitic animosity against Atlanta factory superintendent Leo Frank, who was lynched in 1915 in a notorious mob action following the girl’s slaying. Still, the record’s release marked the first deliberate effort to market “country as country from a country artist for what they believed was a country audience,” Mazor said. Atlanta’s planning department began pushing last April to designate both buildings as landmarks, a designation that could come before city council in August. Officials from Margaritaville Enterprises initially responded to an inquiry from The Associated Press, but did not supply information about the project’s current status. Lemuel Ward, an attorney for the developer that plans to build the restaurant and lease space to Margaritaville, told members of a city planning group July 24 that it wasn’t fair to start the landmark process after the company spent months seeking a permit. “As a developer, we now have tenants that cannot and will not complete this project because of these designations, if they are allowed to go through,” he said. “We believe this is a basic issue of playground fairness.” He said they have lodged a formal objection with the city. Mazor said the old building has enormous value to history and even to tourists. Atlanta in the 1920s was briefly the recording capital of the Southeast, a title Nashville eventually took away.